Planning to do some crazy adventure trip in coming winters? I have an answer for you, “how about planning a trip to Spiti Valley in winters and enjoy the views of the frozen cold desert of trans-Himalayas?”. Well, the answer in the form of a question is very much appropriate when you think about making some crazy adventure trip up in the Himalayas. However, there are things you must be aware of while making a trip to Spiti Valley in winters. You do not want to repeat the common mistakes of Spiti Valley trip in winters. Can I make a trip to Spiti Valley in Winters? Spiti Valley is not a region where you can the land, having no clue about the place, especially when you are talking about an offseason trip to such a remote place in the Himalayas. Your habit of unplanned trips to the Himalayas could lead you to in a serious trouble if you are really interested to take on the challenge of making a trip to Spiti Valley in winters. Hence, in today’s article, I will help you go through some basic tips covering Do’s and Don’ts, what and what not to expect in Spiti Valley in winters so that you are prepared for it. I will also suggest a recommended day by day itinerary for a trip to Spiti Valley in winters in my next article, which will help you plan your night stays in a much better way. It is important to strike the balance of basic amenities on offer, the temperature you need to deal with and the probability of getting stuck for a few days to months in remote regions of Himalayas. Frankly speaking, trust me, being stuck in such a remote region with limited facilities in winters is not such a good feeling at all as you fantasize sitting on your couch in an AC room. 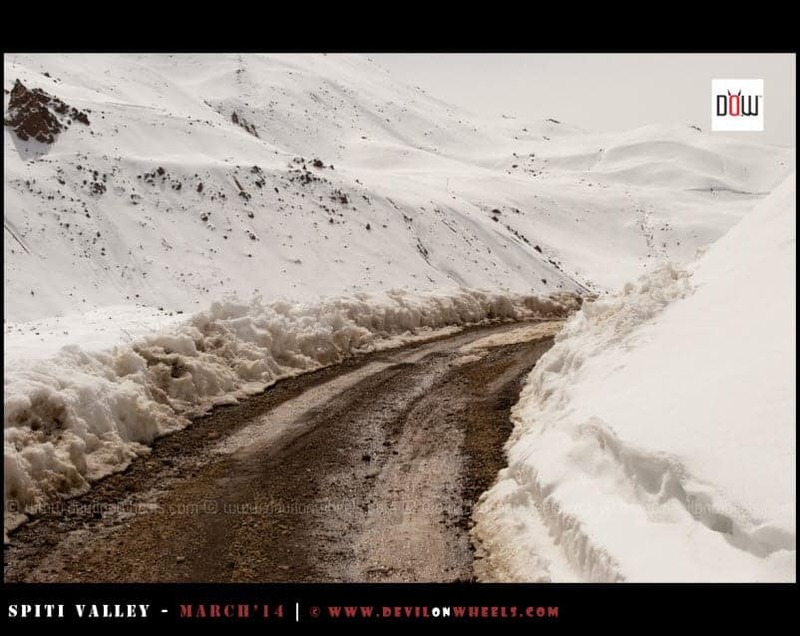 So, you must give utmost attention to a couple of articles I am dedicating for traveling to Spiti Valley in winters. You may have been to Kinnaur and Spiti Valley in summers or autumn sometime back and of course, like me, would have imagined how would it look when filled with white gold we call snow. How these wide, beautiful valleys of Spiti surrounded by towering brown mountains will draw your attention while offering only one color around, that is, White? How life will be when everything around in Spiti Valley is frozen? Well, the answer only lies behind the adventure of taking a trip to Spiti Valley in winters. However, before you plan such a trip full of adventure, please go through the top 15 things listed below that you should expect while on a trip to Spiti Valley in winters. This is the most probable thing that will happen. During the extreme winters, the snowfall can close the roads for a couple of days to weeks to months. A month is rare as BRO keeps the road to Spiti Valley up to Kaza open all around the year but still, monthly closure has happened at times, 2013 as an example. Hence, go well prepared with nothing major to go back home even if you get stuck for a month and carry enough cash to survive the month. ATMs will be at mercy of electricity. If you are riding or driving yourself then be careful of the ice and snow on roads that make the road conditions too much prone to skid. You should have experience of riding or driving in snow as one hard brake can lead you either flying down the gorge or crashing the car in the mountainside. Any help with the vehicle with be very scarce to find as most mechanic shops are closed. Hence, it is very important to drive with extra caution and care on icy patches and snow filled roads. Most of the hotels or guest houses will be shut down along with places to eat. Stays will be available in the form of homestays where basic food is provided. Do not expect other facilities like mechanics, groceries, fruits, filter water bottles, etc.. to be available readily as well. You should be planning well and be prepared with anything and everything you might need in the winter adventure to Spiti Valley. Also, you should read about the tips on budget of Spiti trip. The water in pipes freeze and hence, there will be no toilets with running water. In winters, the toilets remain locked and only dry pits (traditional toilets) are used where there is no water available. Hence, keep your expectations straight. Along with toilets, the washrooms will also not have any running water. Needless to say, as soon as you cross Kinnaur Valley and enter higher regions of Kinnaur such as Nako, you will experience bone freezing temperature. Hence, be prepared with winter gear and carry enough heavy woolens to protect yourself include warm shoes as you will not feel your toes for most of the day. The feeling of freezing increase as you cross Schichiling village (base of Dhangkar) ahead of Tabo in Spiti Valley. The presence of snow and ice at times when the sun shines makes the road slushy. So, apart from snow and ice, expect to drive in slush as well. When the snow melts, especially towards the end of winters, March – April, the shooting stones are common as they come along with the dripping water. These are more common when there is light snowfall as that snow melts quickly. All fluids including diesel in your car will mostly be frozen. The car will require starting every few hours and protect the engine with some cloth to keep it warm. You might need to wake up at night as well and keep ignition on for 15-20 minutes to keep it warm. At times, parking the car in an upright position also helps but not always. Sometimes even the oil in hose pipes also freeze. Don’t forget to prepare and refer my list of 40 must-have things to carry on a self-drive trip to Spiti Valley. There won’t be many tourists around and hence, options of sharing vehicles or dependent on public transport will be limited. The HRTC buses do run between Reckong Peo and Kaza daily but they will park the bus in case it is not safe to travel ahead on both ends of that point. People walk the danger point on foot and exchange buses coming from either direction. This is very common in winters. Hence, be ready for such an adventure and make sure you are keeping your family informed on using any such transport option. Well, when it snows heavily, the electric poles are swayed away or gets buried in the load of snow. So, carry enough spare batteries and keep them warm somewhere as batteries will also freeze to exhaust. Hence, keeping them warm is the key to run them long. This includes your phones as well. Keep phones inside your blankets/quilts while sleeping. Carry enough cash as ATMs might not work as well. SBI bank in Kaza does provide you money even from the POS machine they have installed in the bank in case ATM is not working. However, cash is limited to Rs 1000 in a day. Similar to electricity, you should not expect mobile signals for a few days to weeks to months. Hence, you should inform your safety back at home, friends, and relatives as soon as you see a possibility. Wifi in the bank, wifi in some hotel running a generator, use any possibility you can see available. Messages and Whatsapp work much better than calling homes. Carry only BSNL/MTNL connection. Do read my detailed article about mobile networks in Kinnaur & Spiti Valley. Similar to other things in winters, do not expect much from the medical facilities as well when traveling to Spiti Valley in winters. At times people have to use a helicopter to be dropped off to a safe spot in case of a medical emergency. However, if the helicopter will be able to fly or not, you will still be at mercy of weather gods. Shimla will be the nearest major help. Carry basic and any ongoing medicines in enough stock to last long for a month or so in case required. Do not rely on anything to be procured locally. It is not recommended to travel at all in winters in case you have some ongoing ailment or illness. Roads to most of the tourist villages in Spiti Valley including Dhangkar, Lhalung, Demul, Langza, Lhalung, etc.. will be closed and can only be reached by foot, if at all. The roads to Ki – Kibber, most of the times remain open though. Don’t make a solo backpacking trek to these high villages of Spiti Valley and always travel with some local guide or villager. The road ahead of Kaza will remain closed for the entire winters. Hence, you cannot do the entire circuit from November to mid of June including Chandratal lake. 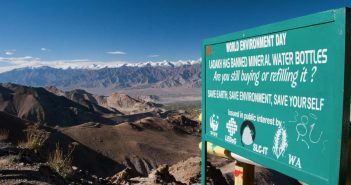 The road clearance from Kaza towards Chandratal – Kunzum Pass starts in March and ends by first or second week of June connecting Kaza to Manali. Needless to say, locals will greet you with the same warmth and hospitality as if you are visiting them in summers. They will do almost all the things to help and feel you comfortable in their homes anywhere in Himachal Pradesh. 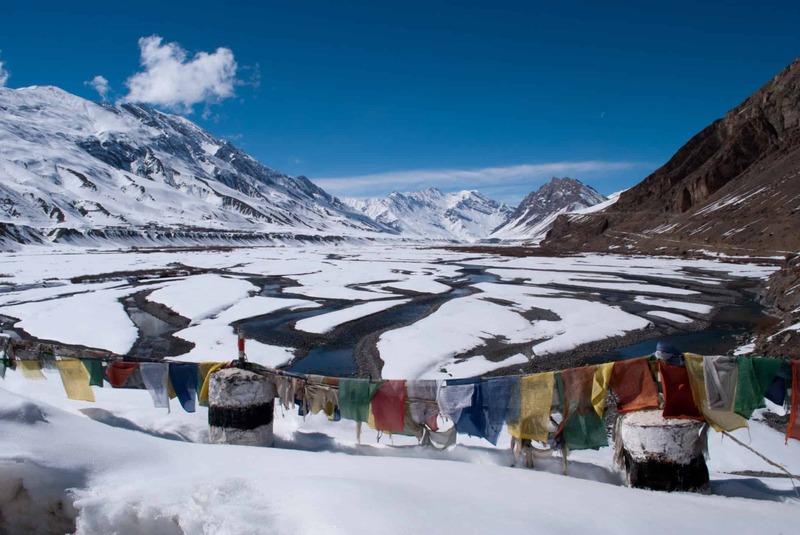 As in summers, the frozen beauty of Spiti Valley is no less magnanimous and your soul will fall prey to it with the very first sight of it 🙂 🙂 … I am sure that a part of your soul will be lost forever in Spiti Valley as you live the winter experience in this remote region of the trans-Himalayas. As described in this first article of the series on traveling to Spiti Valley in Winters, I have tried to highlight what things you can expect while making such an adventure trip. I hope you will take these things as inputs to arrive to the answer of the questions like “Should I make a trip to Spiti Valley in winters?” or “What to expect on a trip to Spiti Valley in winters?”. This article will help you come to a fair and wise decision. Once, you have arrived at the decision, I am sure that the coming article in the series will help you plan the right itinerary for a trip to Spiti Valley in winters. Feel free to share this article with any friends or family whom you know are making a such a trip to Spiti Valley in winters. 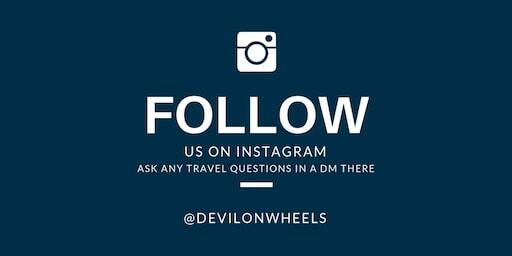 Also, please share your thoughts or inputs in case you feel that will add value and help other fellow travelers making a trip to Spiti Valley in winters. Your blog is really informative and clear. I am visiting HP on 16th of October 2018 – 25 October of 2018. I am interested going to Spiti valley. Would you personally suggest this, what are the pros and cons of such a plan. Any any alternatives that i could go with. I am really interested in seeing snow, no matter where, but bound by a little tight schedule. What are my chances of seeing snow at that time( NOT necessarily SNOWFALL) . Thanks a lot for the blog it helps a lot and is very detailed. As you are experienced I just want to ask that I am planning for Spiti in Jan first week. I want to visit Spiti because of Snow, will I get snow in Jan first week? Is it advisable to visit Spiti in Jan 1st week? 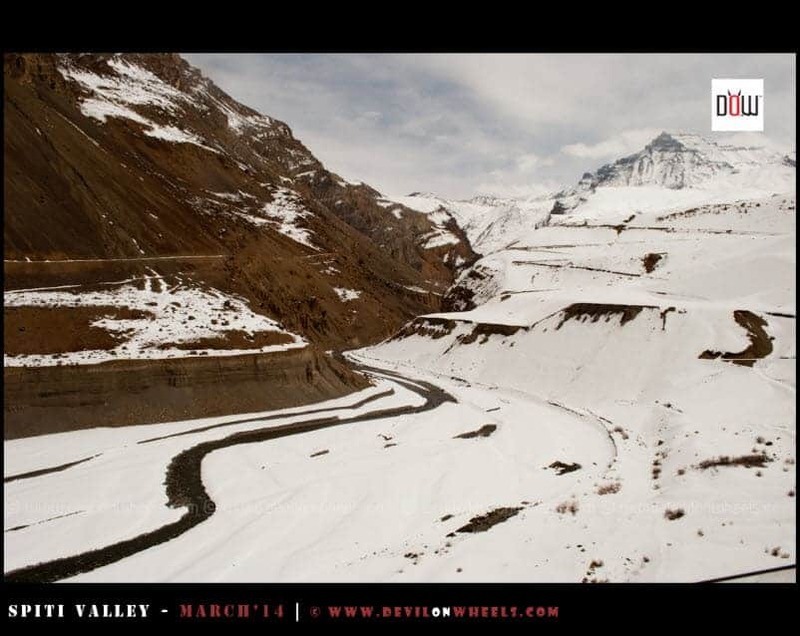 For an immersed experience of snow in Spiti, you should visit Spiti Valley in February or March. January sometimes have snow and sometimes it does not have snow. What would be an ideal time to catch the first snowfall in Spiti this year? Also, how different is the weather during December as compared to say February. And, of December and February which month gives us a better chance of accessing villages like Demul, Dhankar and Hikkim by car. Thank you for your prompt reply. Also, does December hold any chances of access to the upper villages? And, approximately when does access to the upper villages get cut? Cool. That was really helpful. Thanks again. Thanks for the very detailed article. I have a question as I’m planning to go for this during winter. Should I do this mid Jan or mid Feb? What will be the difference? Which month will be more harsh and when will it be snow covered? If you are interested in snow, then go towards end of Feb-Mar. I am planning for spiti valley in july ..s their any snows on that time? Thank you for an excellent article. Planning to go to kaza from shimla on my Scorpio next year around 19 th January. Never driven on snow or ice ever, it’ll be my first experience. Have done both ladakh and spiti trip on my car but in summers. We’ll surely keep your points in mind. Any last minute suggestions? I am planning to go spiti valley in december end.. so i can go buy road on car?? I am plannig to go from shimla-kalpa-kaza..roads are closed but i can go buy road on car?? Shimla – Kalpa – Kaza remains open all round the year but closes during the time of heavy snowfall only. Also, please read that the road may close from some days to some weeks, so plan accordingly. All depends upon the amount of snow. Thanks man!!!.. we have take snow tyres chain with us?? Probable yes in case it snows around during that time. It might come very handy. This is an excellently written article. Which month does the photos above depict though? I’ve been to spiti in May and September already and wanted to experience the winters there. So I have planned a trip there in early December (first week). This time I plan to go to pin valley as well. The best part is I know people there so i think there wouldnt be any problem for the stays. But anything else I should keep in mind? Also, would the water freeze which is being carried in a backpack? Aman, the pictures are from March first week. I think whatever mentioned in the article must be kept in mind and make sure that weather is clear before entering Pin Valley. 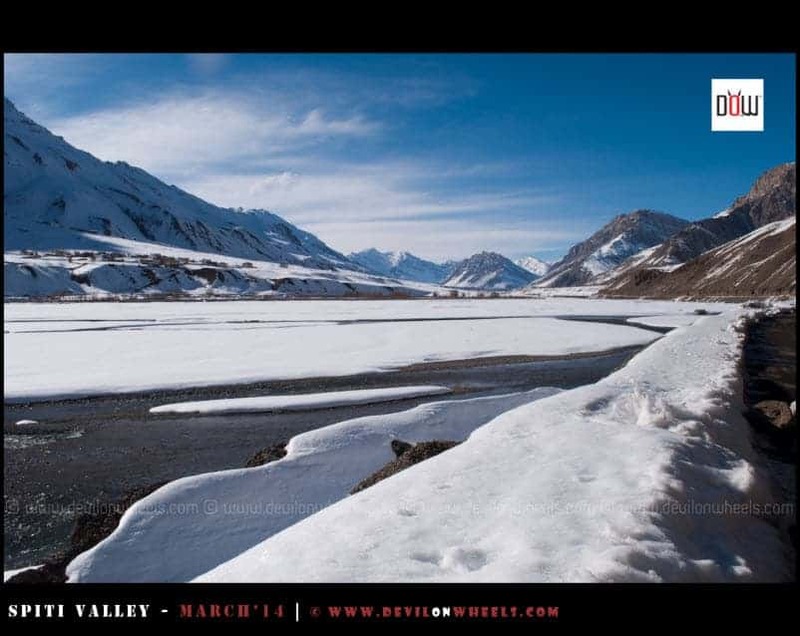 Pin Valley remains cut off from rest of Spiti Valley in winters and in case you take that road and snowfall happens overnight or on the way, you may get blocked for the whole of winters. Water will freeze overnight. I am traveling to Spiti this Dec by 25th. And I have discussed it with Spiti Inbound to facilitate my trip. Any suggestions from your side ? We planned to travel from 20th Jan 2018 will it be safe. Amit, Spiti Valley will be quite harsh during that time of the year. Have you read the article above? Are you still interested in making the trip? If yes, we can discuss the plan futher. We are a group of 4 guys from Kolkata planning to travel from Shimla till Kibber this year between Dec 25 to 1st Jan-18. Researching on the trip I agree that the trip is very risky, but doable. I contacted some local taxi associations in Shimla, but no one is ready to venture that road in Dec end. 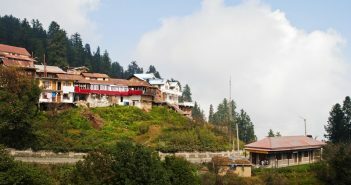 Can you please provide some details or contacts if we want to hire a car from Shimla for this trip? Also it would be helpful if you can provide some local contacts along the way. Arita, no one will be willing to take that road during the winters. You will have to make that journey either on public transport or your own transport. As mentioned in the article the road between Reckong Peo to Kaza can close from a couple of days to a couple of weeks to couple of months. So, no commercial person will be ready to take that risk when they have business down at their current locations. Neeta, the temperature will be sub-zero mostly and nights will go below 0 as well. It will be cold and dry in Spiti Valley during that time and most hotels will be closed. You need to rely on basic food and basic stay. Rest I have provided tips for a trip to Spiti Valley in Winters above. Snow on the roads will only be possible if it snows during that time. Usually, there is not much snow in November. thank you dheeraj for your guideline. I selected november so that we dont need to go through harsh winter of spiti unlike december january now i just hope that it snow during that time and also that we dont get stuck. Best wishes for the trip, please go prepared. Loved the way you described Spiti here. I travelled there last year from manali. It was mesmerising, though I agree with your AMS suggestions. This time I want to explore the Hindustan Tibet highway. I have never experienced snowing, hence want to do this trip in October. Will that be feasible? Thanks a ton Dheeraj for a prompt reply. I researched last night and they say it doesn’t snow in October. Is that true? If yes, when does it start snowing there? Yes Rucha, in October it snows a day or two and then it melts away. The main snow starts in November end and December. If you want to make a winter trip to Spiti with snow all around, then Feb – March will be a better time to visit, of course with risks of no light, road being closed from days to weeks. In that case, is Ladakh safe to be travelled to in November? Rucha, Ladakh has flight connectivity so that means you cannot get stuck for weeks to months in Leh. Hey dheeraj, whats the best route to spiti valley during New Years time to avoid snow blocked roads and is the calley even accessible during that time. There is no such route that you can avoid from snow blocked roads. In case it snows very heavily, the Shimla – Kinnaur – Spiti road can close for weeks to months. So, plan with a calculated risk. Will it be worth going during that time. And what route should be taken. Unless you are used to such harsh conditions and very cold conditions, I will not recommend making the trip to Spiti Valley. Raw and basic food will be available and hotels will be closed. Stay options will be limited to home stays and even toilets will be dry pits without water. If you still want to make the trip, you have to go from Shimla – Narkanda – Powari – Reckong Peo – Nako – Tabo – Kaza route and come back the same route. Is it advisable to go on a trip to spiti trip in November 2nd or 3rd week?? What are the chances of finding snow ?? If not spiti at what places can i find snow starting Novemeber last week or even before?? Well, it gets cold up there in winters in Spiti Valley. You can travel by road from Kinnaur – Shimla but avoid going from Manali side that late. Rest most of the suggestions in the article above holds true here as well. September is the best month but since you are interested in frozen Spiti Valley experience, Jan End to Feb will be great. No Charu, the road to Chandratal does not open and trekking is not feasible in the month of May to Chandratal. It is as if going into the dead land, so even if some insane agency/individual offer you something like this, please turn down the offer. Can I do the full circuit of Spiti from Shimla to Shimla in End of July. Is it right time to do ? How many days should I have Shimla to Shimla ? Yes Yogender, April last week will let you enjoy snow in Spiti Valley. 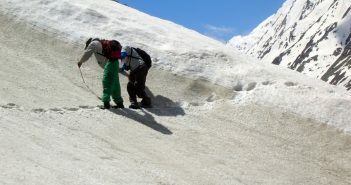 You can especially travel beyond Kaza till the point where road is open and enjoy in tons of snow towards Kunzum Pass. I GOT SOME BASIC IDEA FROM YOUR DESCRIPTION ABOUT TRIP TO KINNAUR, SANGLA VALLEY AND SPITI VALLEY.I AM PLANNING TO TRAVEL IN MARCH END TO SHIMLA, 26TH TO 29TH EXACTLY , AFTER WORD WHICH PLACES I CAN VISIT FROM THERE? I HAVE SARAHAN, SANGLA CHITKUL IN MIND, WILL BE SELF DRIVING CRV4WD AND HAD BEEN UPTO THANEDHAR IN APRIL END BEFORE 3 YR. WE ARE FAMILY OF 3. CAN U SUGGEST ITINERARY AND PLACES TO STAY AND ANY PARTICULAR PRECAUTIONS? Request you to please avoid CAPS letters. I see you have just 4 days in hand and going to any of these places will basically mean lot of hectic driving in just 4 days. Are you starting from Delhi to Chandigarh? Weather depends upon during those days weather only. Sometimes sunny sometimes dark, we had sun only 1.5 day of our travel. Thanks a lot. I believe PWD Guesthouses will be open at hat time, right? It depends, sometimes yes, sometimes no. Depends upon the caretaker and toilets working or not. I have plans of visiting the Spiti Valley in mid-end Jan.
Is Dhankar & Pin accessible in this part of year ? Also do let me know for homestays with contacts(if possible) at Tabo, Dhankar, Pin(if possible), Kibber. Thanks Dhreeraj, So when is the best time to visit and see snow too ? how about end of May or 1st week of June ? will i get to see some snow ? Sean, in case you are not interested to do whole circuit and are OK to go from Kinnaur and come back from Kinnaur only, then go in April end of May to get snow filled views. I am planing to take a full circuit with 15 days in hand – starting from Shimla – Narkand – Kalpa – Nako – Tabo – kaza -Kibber – Manali and back to Shimla. In that case, June will be apt time to do the entire circuit because the road from Kaza to Manali opens around second week of June. I have gone through the article and comments, I am planning a trip in first week of Jan 2017 and have few question. Is it possible to cover the stretch till Chandra taal Lake and back to Shimla in 4 Days. If not how far i can travel ? Is it safe to drive a SUV, Based on road condition & Snow, I will be traveling with family , friends & a KID too. Will there be too much snow on the roads. The road beyond Kaza gets closed in winters, so Chandratal is not possible. You can travel up to Kaza at max. I will not recommend to make a trip with family and kids into Spiti Valley at that time of the year. It will be too dangerous to go up there with kids. 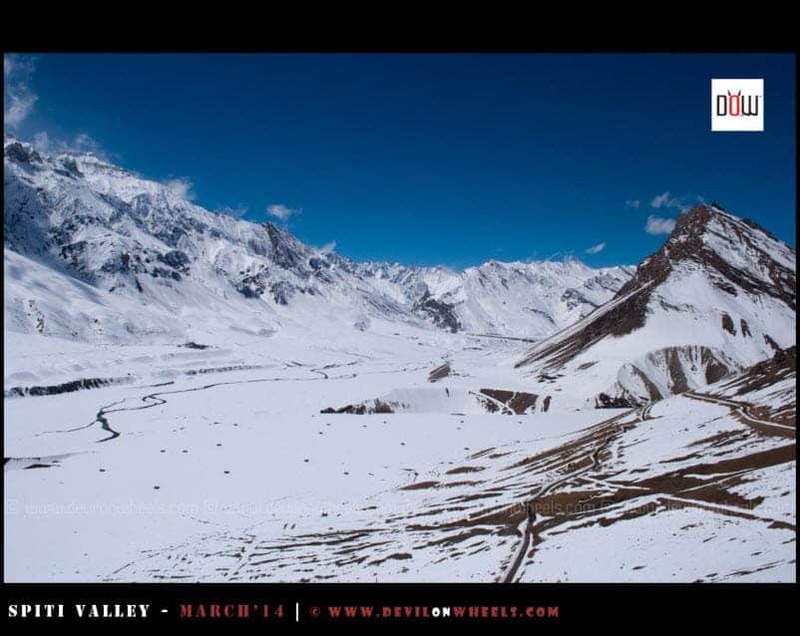 2- Can I expect White Spiti in this time frame(25 Dec to 5 Jan) as It is shown here (https://devilonwheels.com/spiti-in-winters-common-itinerary/) for March month. 1. You have read the article above and that’s best pointers that you should keep in mind. Then, apart from that you sould definitely be prepared with stocks of food, dry fruits and heavy woollens and a heavy jacket. Do not forget woollens socks and if possible warm shoes. 2. It may not be completely white by that time as snowfall has just started but you may get glimpses of it. This much snow is better if you visit in Jan end to March. BTW can you redirect me to the page where I can find some pics of Kaza/Spiti of time frame of Dec end to Jan start, if it wont be satisfying(in Pics) I will re-plan my travel for March month. How will be the weather in March? Any idea on availability of Public transport? Anshul, it is all frozen in March. Check the travel tales section to read about my trip in March to Spiti Valley. The buses runs for sure between Reckong Peo and Kaza. Public transport is limited to road opening or closing. Hi Dheeraj, I just came back from Kinnaur-Spiti trip this Oct-end. I am planning to visit Himachal again at the beginning of March. I would love to be in snow and beautiful places, considering that I already had the taste of the most beautiful places of Himachal just few days back. Can you please let me know which places should I cover in March, where there will be less chances of road block due to snow but can match upto Spiti standards. We are not self-driving. We will hire a car. Thanks for your help in advance. I will be frank, it will be difficult to get such a place in March as both Pangi and Lahaul valley will be closed during that time and remain cut off. Those are the only places come close to the beauty of Spiti and Kinnaur Valley in Himachal. So, it will be better if you choose something like Tungnath – Chandrashilla – Deoria Tal – Rohini Bhugyal hikes in Uttarakhand to enjoy great views of Chaukhamba range and hike in wilderness of nature. Hey can u provide contact detais of homestay in kaza for winters? Hi Dheeraj, I am planning to go to Himachal in December for 6-7 days. To be precise from 5th December to 13th December. I read your replies to other comments and realised that going to Spiti is not feasible. However, is is possible to explore other parts of Himachal on the said dates? Kindly suggest. Thank you in advance. Yes Pushkar, the article describes how you can plan a trip to Spiti Valley and what shall be expected up there during that time period. You can surely try to visit Kinnaur Valley including Sarahan, Kalpa and Sangla during that time of the year. Chitkul will be closed in December. As always, thank you for this article and many others I’ve reliably used for my Himalayan trips. This November 16th, I’m planning to take a trip with my wife in an SUV. This is our first road trip so I thought of going till Kalpa/Sangla and returning to Shimla. Can i expect snow fall on the road to Kalpa region in mid November? Mohid, in November unless it snows on the day you are traveling it will be hard to find snow on road to Kalpa. Surrounding peaks will surely be having snow on them though. Go prepared with heavy woolens. Yes, it is possible to do Spiti but better plan before mid of October so that chances of getting stuck between Manali – Kaza are less scary. Your article is awesome!!! That is u making me to go to this trip.. i hav been to keylong, manali, kashmir, kargil, srinagar before but this time i m planning to go leh via spiti ( Hindustan-Tibet HIghway) just bcz u hav desribed its beauty very well with pictures, so is it possible if i leave from palanpur(gujarat) on 29th Oct as my vacation starts from this date? or if Leh is not possible(due to winter & POK issue) than what r the other choice? bcz i know it will be winter time as i reach himachal on 1st of Nov.. we r frnds(5 Person) planing this trip with Duster RXZ 110ps Diesle. guide me if i m doing any wrong…. No Amin, it is not possible to make a trip to Leh from Spiti Valley or Manali – Leh Highway that late in the season. You can get stuck in the middle of no where for months and no help at all. Amazing photographs. Very useful post.